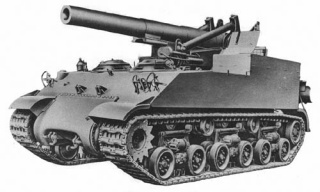 The Long Tom and its successor, the M43, became the most powerful Allied artillery. The M40 fought in the battle for Cologne in 1945. Both vehicles were used during the Korean War. The M40/M43 has an excellent traverse speed compared to the GW Tiger and Object 212 and its top speed is good as well. The M40/M43 has a lower damage output than both those SPGs but makes up for this with its mobility, giving it the ability to relocate quickly if it is spotted by enemy tanks. Stock vehicle is the M40 version with 155mm gun. 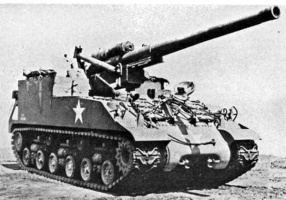 With the 8-inch Howitzer mounted the vehicle becomes the M43 version. Size matters in selection of arty guns. Get the big one. It adds 10 seconds to reload time, but little aim time difference. This page was last modified on 23 August 2014, at 02:21.